Fathom: Dawn of War bridges the gap between the original series and Fathom vol. 2. The story focuses on the Blue warrior Kiani, who is forced to side with the rebellious councilman Marqueses in order to save her master, Casque, from the clutches of human military scientists. Marqueses has engineered the situation in order to kidnap Casque and to secure the older warrior’s immense power for an offensive against the humans. Kiani tracks down Marqueses and saves Casque only to find he is part of the Black. The Black come for Casque, and he is forced to rejoin them, leaving Kiani angry and lost. Dawn of War emphasizes Kiani’s loneliness and character development. It also introduces audiences further to the underwater world of the Blue. In an attempt to prevent Wolverine from finding them, some members of the government send Nuke to stop him. Captain America, Cyclops, Emma Frost, and Hellion intervene. Frost reveals that Wolverine has a son, Daken, who is being controlled by the government the way Wolverine had been, and that Daken hates his father. 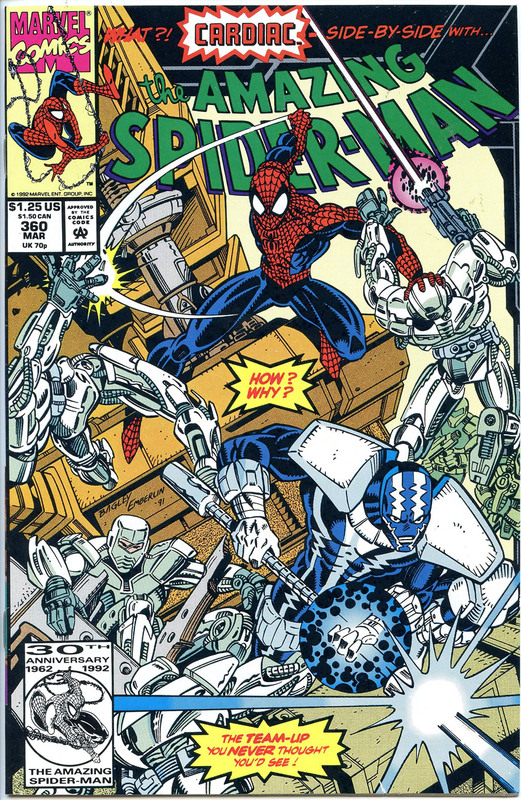 A hologram on the cover of issue #90 (July 1992) marked the 30th anniversary of Spider-Man’s first appearance. A four-part crossover with Ghost Rider/Blaze: Spirits of Vengeance began in issue #95(December 1992). Spider-Man donned “Spider-Armor” in issue #100’s troy by Terry Kavanagh and Saviuk. The “Clone Saga” storyline began in issue #117 (October 1994) and Ben Reilly became the Scarlet Spider in the next issue. After issue #129 in October 1995, the title was renamed Web of Scarlet Spider and started again at #1. After four issues, the series was cancelled to make way for the new The Sensational Spider-Man title. Adventure Comics was published by DC Comics from 1938 to 1983 and revived from 2009 to 2011. In its first era, the series ran for 503 issues (472 of those after the title changed from New Adventure Comics), making it the fifth-longest-running DC series, behind Detective Comics, Action Comics, Superman, and Batman. It was revived in 2009 by writer Geoff Johns with the Conner Kent incarnation of Superboy headlining the title’s main feature, and the Legion of Super-Heroes in the back-up story. It returned to its original numbering with #516 (September 2010). The series finally ended with #529 (October 2011), prior to DC’s The New 52 company reboot. The storyline in Youngblood led directly into Prophet’s own title, which lasted eleven issues (including a zero issue). A second series, written by Chuck Dixon, premiered in 1995 and lasted eight issues. A one-shot was released in 2000 by Awesome Comics. During the 80’s Frank Miller was hired to continue the title and did so in a similar vein to previous writer Roger McKenzie. Resuming the drastic metamorphosis the previous writer had begun, Miller took the step of essentially ignoring all of Daredevil’s continuity prior to his run on the series; on the occasions where older villains and supporting cast were used, their characterizations and history with Daredevil were reworked or overwritten. Most prominently, dedicated and loving father Jack Murdock was reimagined as a drunkard who physically abused his son Matt, entirely revising Daredevil’s reasons for becoming a lawyer. Spider-Man villain Kingpin was introduced as Daredevil’s new nemesis, displacing most of his large rogues gallery. Daredevil himself was gradually developed into an antihero. In issue #181 (April 1982), he attempts to murder one of his arch-enemies by throwing him off a tall building; when the villain survives as a quadriplegic, he breaks into his hospital room and tries to scare him to death by playing a two-man variation on Russian roulette with a secretly unloaded gun. Comics historian Les Daniels noted that “Almost immediately, [Miller] began to attract attention with his terse tales of urban crime.” Miller’s revamping of the title was controversial among fans, but it clicked with new readers, and sales began soaring, the comic returning to monthly status just three issues after Miller came on as writer. The major event many cite as marking the beginning of the Golden Age was the 1938 debut of Superman in Action Comics #1, published by the predecessor of modern-day DC Comics. The creation of Superman made comic books into a major industry. Some date the start to earlier events in the 1930s: The Overstreet Comic Book Price Guide‘s regular publication The Golden Age Quarterly lists comic books from 1933 onwards (1933 saw the publication of the first comic book in the size that would subsequently define the format); some historians, such Roger Sabin, date it to the publication of the first comic books featuring entirely original stories rather than re-prints of comic strips from newspapers (1935) by the company that would become DC Comics. The Silver Surfer debuted as an unplanned addition to Fantastic Four #48 (March 1966). The comic’s writer-editor, Stan Lee, and its penciller and co-plotter, Jack Kirby, had by the mid-1960s developed a collaborative technique known as the “Marvel Method“: the two would discuss story ideas, Kirby would work from a brief synopsis to draw the individual scenes and plot details, and Lee would finally add the dialog and captions. When Kirby turned in his pencil art for the story, he included a new character he and Lee had not discussed. As Lee recalled in 1995, “There, in the middle of the story we had so carefully worked out, was a nut on some sort of flying surfboard”. He later expanded on this, recalling, “I thought, ‘Jack, this time you’ve gone too far'”. Kirby explained that the story’s agreed-upon antagonist, a god-like cosmic predator of planets named Galactus, should have some sort of herald, and that he created the surfboard “because I’m tired of drawing spaceships!” Taken by the noble features of the new character, who turned on his master to help defend Earth, Lee overcame his initial skepticism and began adding characterization. The Silver Surfer soon became a key part of the unfolding story.